Green activism played a critical role in the downfall of Soviet-style communism in Eastern Europe at the end of the 1980s. 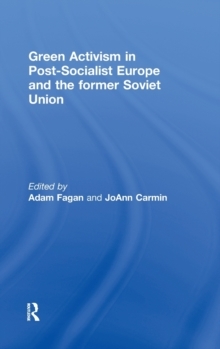 After the revolutions, environmentalists were expected to exert influence within the new democracies and to form the bedrock of the new civil societies that were predicted to flourish across the region; the prospect of EU membership provided activist networks with even greater optimism about their political opportunities. Two decades later what has been the impact of political and economic liberalisation on environmental campaigners and policy advocates? Has access to elites increased with democratisation and Europeanization? To what extent does the realm of environmental politics, within individual states and across the region, continue to represent an optic on change and continuity?Through country case-studies and comparative analysis of national movements, this edited volume addresses each of these questions and provides a different perspective of green politics in the region. This book was previously published as a special issue of Environmental Politics.